If you like small pets or do not have a lot of room, raising a Chihuahua puppy gives you the opportunity to own a dog. Bringing a puppy into your home can be one of the most rewarding and enjoyable experiences for you and your family. 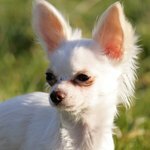 Providing for this petite canine might take more attention than what is needed for other breeds; however, Chihuahuas are generally easy to take care of once you understand their needs. Prepare and designate an area of your house where you will house train your puppy. Using a crate is an effective way of house training a dog. Set up a crate large enough for your Chihuahua to turn around in yet small enough that cannot designate a corner for relieving itself. Accustom your puppy to the crate by feeding and watering it near or in the crate. Repeat a key phrase such as "into the crate" as you lead it inside, immediately rewarding the puppy with a treat. Put a harness and leash on your puppy, and lead it outdoors for elimination upon leaving the crate. Keep your puppy warm because Chihuahuas are generally very sensitive to the cold and dislike being outdoors. For indoor warmth, line your puppy's crate with warm soft blankets. During the winter and on cooler days, put a coat or sweater on your puppy before heading outdoors. Ensure your puppy's health by regularly scheduling visits with a veterinarian. Make sure your puppy receives all of its necessary vaccinations. Additionally, depending on your city's regulations, you might be required to have your puppy spayed or neutered upon adoption. Give your puppy plenty of chew toys to play with so its attention is focused away from furniture, carpets, shoes and anything else that might be at dog-level throughout your house. Establish play and exercise time every day to help your puppy develop a relationship with you and your family. Chihuahuas generally are loyal to one person but exposing them to your entire family from the beginning helps them become more sociable as they enter adulthood. Brush the fur on long-haired puppies several times a week, and clip toenails as needed.